much love, illy: naked hope. i have always been amazed when a book drops into my life at the right moment, right when you needed it right then and there. almost as if the author was eavesdropping on your life and heard through the grapevine that his or her words were written out exactly for you. and most recently, the book that fell in my lap and knew it felt like it was written for me was Naked Hope: Discovering Beauty in Our Vulnerability by Abby Jackson. 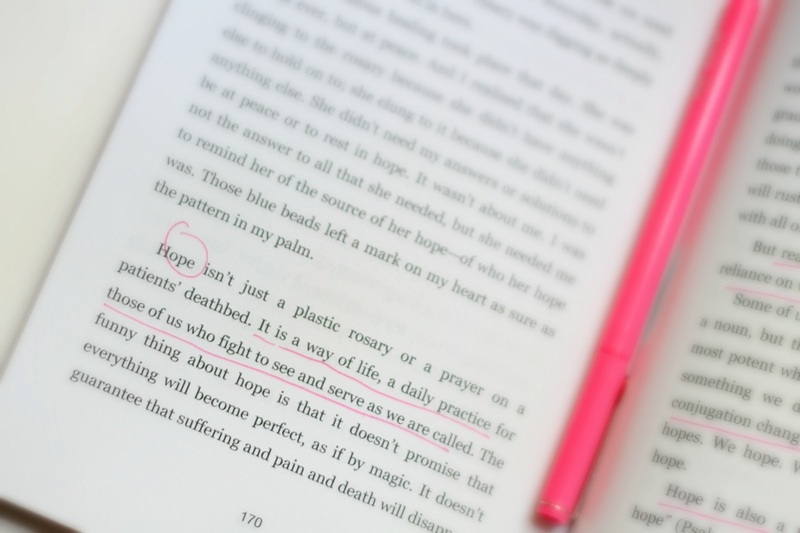 Naked Hope is more than a memoir about the experiences of a nurse and her interactions with her patients. it reveals the honest, raw moments that Abby (who works as a nurse in an inner city hospital among both the poor and the elderly) has experienced in her lifetime as well as within in the walls of the hospital, being stretched and learning to what is truly the definition of hope. if i were to hand you my copy of this book, you would flip through the pages and find phrases, sentences and whole paragraphs underlined in bright pink ink. you will also find the pages dog-eared and the cover bent from the afternoon on the couch or the late nights in bed when i devoured this book. some of the most pink-highlighted of chapters were the ones that brought tears to my eyes, gripped my soul and made the goosebumps raise on my forearms. i also appreciate an author who writes from the depths of her soul - not just the pretty parts, but even the ugly struggles and real heartaches. that is what i loved so much about Abby and her writing. i felt like we were having a conversation, sitting across from each other at a coffee shop, and she was baring her soul to me, a complete stranger. and as you delve deeper into the pages of Naked Hope, you will see that Abby points readers to the fact that beauty is found in the midst of our messy lives and our vulnerability - and within that process of discovering, you will then discover true hope. purchase a copy of Naked Hope HERE or check out the Naked Hope Book Trailer HERE. 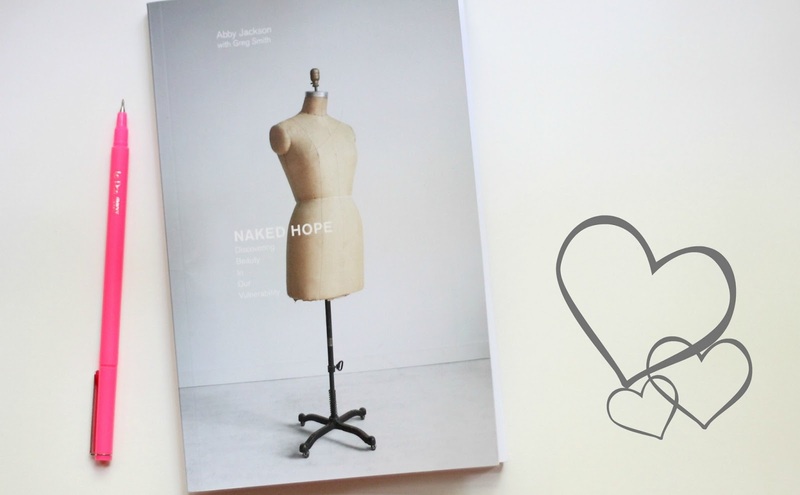 and today Abby has more than generously offered to giveaway TWO copies of Naked Hope to TWO Much Love, illy readers! if you are looking for something refreshing and inspiring or maybe you are looking for another book to add to your ever growing summer reading list, this is a great opportunity to get your hands on this book! Giveaway is open to ALL Much Love, illy readers thru May 21st. Winner will be announced on May 22nd. I have been struggling with chronic illness/pain since I was 14. Hope has been a word I have clung to since then. For me hope means trusting that God has a better plan than I can imagine and that one day I will be better. Seeing little things each day that remind me that God is good and there is always hope. Having hope reminds me that God is using even the hard things in life to use me for His glory. Would love to read this book! Oh, wow. I could definitely use this book. Hope? It's the feeling with each new day. It's the yearning in your heart and the knowledge in your head that there's more to this life than what we can see right here and now. Hope is what I cling to so desperately every waking hour. Hope is my faith in Jesus and my reasoning that everything in life has a purpose. I really would love this book!! I would say hope is something that i hold onto everyday. the idea that something better is out there- something worth waiting for and hope gives you that you'll get there. And for what hope is, I would it is believing that are better things ahead. This book sounds amazing. To me hope is a feeling, a feeling for certain things to happen. We all hold on to hope every day for one reason or another. looks like an amazing summer read! To me hope is the silver lining of all situations and the idea that it gets better. I almost bought it the other day but they were out of stock! I hope I win! Hope is knowing that even when things seem unclear they will work out in the end. You may not even know where "the end" is, but you hope it's there and trust that you'll find it. Hope to me is having faith that God has a plan that I can't really see and trusting that things will turn out the way that they're meant to. How do I define Hope? It's that little moment of peace in a long day. It's a smile on a broken face. It's love, when we don't deserve it. It's God. Jesus is Hope. I'm not sure how else to describe it, but... there is no true hope apart from Jesus. Hope is believing in the goodness of God even when I can't clearly see His face or feel His fingertips in my life. It's trusting that Jesus is working in me, shining through others and covering this world with his plan. Hope to me means that knowing that everything happens for a reason and knowing that whatever happens it's in my best interest. It's keeping faith in my life's purpose and believing that everything will work out in the long run. hope is waiting for the future to happen! WOW. I just watched the book trailer and it really moved me. I think hope is more than the feeling that what is wanted can be had. It goes hand in hand with faith, and trust. Hope is having faith that things will work out and that the dots will connect even though you can't really understand how it will just quite yet. Hope is believing that there is something greater at work in this life than little old me, that God holds all the pieces of the story in His hands. Ok, so i found you through the "bloggers i love to read about" prompt on the 30 day challenge from like - 2 of the girls i like to read occasionally. and for real? this book? i am just about to start my life long journey as a RN and this seems perfect! i've often wondered how to weave my faith into touching patient lives and not seem like - hey, i'm misty, i'm a christian, God loves you and you should love Him too!